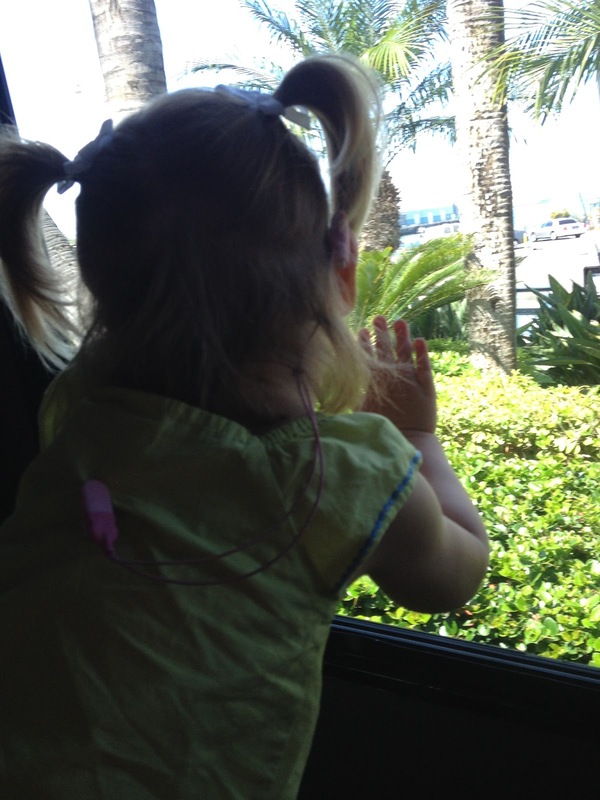 We just got back from our little summer vacation to San Diego. It was a fun little getaway from our regular business! We flew down on Thursday. It was a short flight from Oakland, and Scarlett did very well on the flight, though she was a little unsure of it all. The hotel I booked was just a good deal online, but it was better than we expected! There was a (free!) shuttle to/from the airport, zoo and tourist areas, and was across the street from the maritime museums and San Diego harbor, so it had nice views and plenty to see and do within walking distance. On the shuttle bus - fascinated by the freedom of no car seat! The polar bears put on quite a show for us! The animals were fun, but our real goal was to meet some friends at the zoo. Two years ago, just a day or two before Scarlett's tumor was removed, I got a message from Michelle, telling me to not give up, that her son Riley and a few other kids had survived the same tumor. It was the first time anyone had told me that she really might live. It was a very powerful moment, and all through chemo, and over the last two years I referred to her when I had questions about treatment questions, and just to follow Riley's progress. Well, Mr. Riley is now 4, and was granted a Make-a-Wish trip to San Diego from their home in North Carolina. He got to visit all the fun stuff in San Diego - Sea World, Legoland, the zoo and Safari Park. They invited us to meet them somewhere, since it's the closest to us they have ever been. We were thrilled, and booked it. So, when we got to the zoo, I was much more entertained by Riley and his big sister Lizzie who made sure Scarlett stayed happy. And it got better: in the evening, a third family met us there! 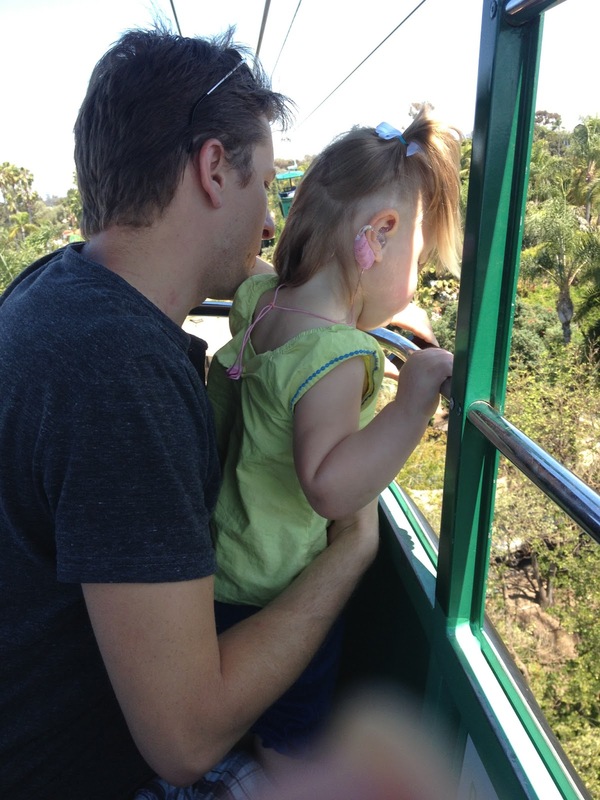 Lily is also 4, and her family lives in Southern California, close enough to drop into the zoo whenever they want. They came in for dinner, an we got all three kids together, plus all the parents and siblings. Lily and her twin brother Sammy and big sister Danika had fun playing with Lizzie, Riley and Scarlett, so everyone was having a blast. We parents sat around and compared stories: all our kids were diagnosed as little babies (Scarlett and Riley both at 9 weeks, Lily at 4 months), as most all congenital tumors tend to be; we were all told that treatment was unlikely to work and to go to hospice; Scarlett and Riley were on the same St. Jude treatment for the first year, while Lily had a different plan. Riley and Lily have both been cancer-free since their original treatments. All three kids still have therapies of some sort, and we all hold our breath every few months when any of them get MRIs. 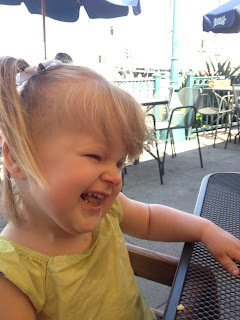 Last year, Lily's dad Magnus started a Facebook group for our little group, and we have found about 12 kids who are living after this same tumor: Connor, George, Abby, Riley, Lily, Scarlett, Sinead, Faylynn, Lillee Jean and few more. They are fabulous kids, and have amazing parents whom I hope to meet in the future. It's an amazing this to find someone who has been to the battlefield like we have; all having had the same tumor is like a badge of honor - we were all told we would probably never find someone else with the same, and the doctors are all shocked that we know so many! We had to leave the zoo far earlier than we wanted to to catch our shuttle, but we're hoping to get together with everyone again sometime. Someone mentioned taking a cruise vacation together - I say YES! And, just for those who might be curious, Make-a-Wish is not just for kids who are dying, as many people think. Kids with life-threatening illnesses are eligible for wishes once they are 2.5 years old...which means Scarlett will get one some day, too! Our plan is to wait until she is able to have more of a say in what she would like; we're hoping we get the chance to wait as long as we can. We have one friend who waited 15 years after diagnosis, and their son chose a Mediterranean Cruise...sounds like a good plan to me! The last day of our trip did not go as planned, since the beach was having riptides and jellyfish warnings, so we just wandered through some of the nearby areas until we were all too hot and tired. Scarlett zonked out early, so we watched the free HBO and ate take-out in our room - not the most luxurious vacation, but we enjoyed the chance to relax. The next morning, we got a call from our airline that our flight was delayed - due to fog! That's something we basically expect in San Francisco, but not after 85 degrees in sunny San Diego! It turned out to be a short delay, but any additional minutes of waiting in the cramped and crowded airport terminal was too many. 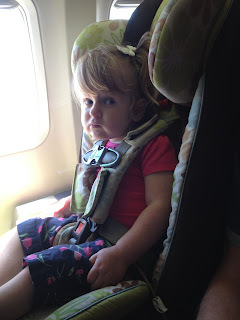 There were no seats since several flights were delayed, so we sat on the floor, and paced with a screamy, tired, out-of-sorts toddler - I'm sure everyone there was scared to sit near her on the plane!! 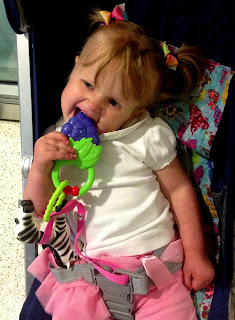 She did fine once we were settled on the plane, and was happy to be back home. Now we're back to our same schedule for a few more days - Scarlett's school year ends next week, and my summer school class ends the following week. After that, we will have our very first taste of a summer break - no school or work for anyone! I can't wait! She's adorable! Glad you enjoyed your vacation. Scarlett's hair is getting so long! She is totally adorable! How nice you were able to spend time with other families that have gone through what Scarlett is going through. Sounds like a great support group.